Tuesday, May 14, 2002... Greetings from Miles City, Montana, near...nothing. In fact, Miles City, pop. 8487 according to Rand McNally, is the largest city for 110 miles in any direction. The call letters of local radio station KATL offer a clue about the local economy. Yet even out here, there's an espresso stand ("Montana Cactus Juice") in the parking lot of the nearest gas station, and the motel desk clerk wore bright blue nail polish and had her eyebrow, but not her ears, pierced. Today's sightseeing had a certain symmetry. I began at the Crazy Horse sculpture near Custer, SD, and ended at the Little Bighorn Battlefield where Crazy Horse led the forces who killed General Custer and his troops. The Crazy Horse sculpture has been under construction since 1948 and, as the photo suggests, is unlikely to be completed in my lifetime. It's being carved in the round, as a fully three-dimensional statue of Crazy Horse atop his horse. If and when completed, it will stand 563' high (taller than the Washington Monument) and 641' long; all four of the Mt. 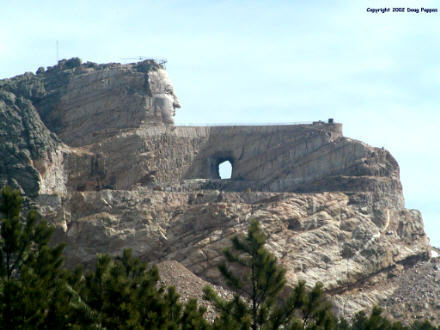 Rushmore heads would fit comfortably onto the rock behind Crazy Horse's face. The site also contains an extensive Indian Museum of North America and numerous opportunities for visitors to spend money -- an especially worthy cause, since the project has refused all offers of state and federal financing and subsists almost entirely on donations. And since I was in the neighborhood, I swung by Mt. Rushmore to add a couple of digital images to the collection. Thanks to the super-powerful zoom, my Web site will eventually contain closeups of each of the heads. On my way out of the Black Hills I stopped for two sets of animals -- the Bear Country USA drive-through wildlife park and the six concrete dinosaurs erected on a hilltop above Rapid City as a WPA project during the Depression. With two more states to cover before nightfall, I reluctantly passed up many more fine Black Hills attractions, including the Presidential Wax Museum ("From George W. to George W."), the Old McDonald's Farm petting zoo, and Beautiful Rushmore Cave (yes, "Beautiful" is part of the name). If I ever feel like staying more or less in one place for a week, the Black Hills would be a fine place to do it -- and I highly recommend it as a family vacation spot. The altitude helps keep things cool during the summer, too -- so cool in places that snow was still visible near the Crazy Horse sculpture. I headed northwest on I-90 past Sturgis, which every August hosts the continent's largest gathering of motorcyclists, and the road to Deadwood, an Old West mining town virtually destroyed by the low-stakes gambling that was supposed to save it. 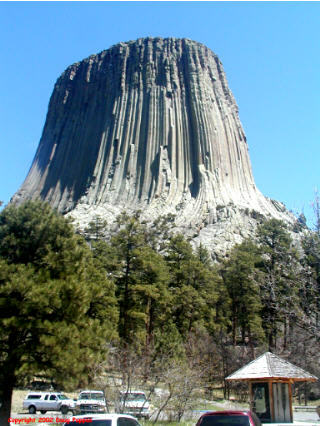 Half an hour into Wyoming, I turned north for Devils Tower, America's first national monument and a sight familiar to anyone who ever saw "Close Encounters of the Third Kind." No aliens today, but the 867' high rock formation gleamed in the afternoon sun, a landmark visible from miles away. Then came a drive for which the car stereo and cruise control were invented: 200 miles across northern Wyoming and southeastern Montana, speed limit 75, traffic virtually zero. The most entertaining sights were the billboards battling for the Yellowstone traffic: US 16 is the "fastest" and "most scenic," while US 14 claims to be the "most popular" and "safest." In Montana, I-90 cuts through the Crow reservation for 50 miles en route to the Indians' last hurrah, the Little Bighorn Battlefield. Little Bighorn ranks among the most controversial Park Service sites. It was called Custer Battlefield until a decade ago, when in response to Native American protests the name was changed. For all the whining about political correctness, the change was unquestionably proper: other American battles are named after geographic features like cities or rivers, not generals -- and certainly not losing generals.